I recently spent an extended weekend in New York City. Along with the well-known sights, sounds and tastes of the Big Apple, I was excited to visit the Tenement Museum, a restored five-storey building at 97 Orchard Street that educates visitors about life in the Lower East Side during the late nineteenth and early twentieth centuries. The non-profit museum, which also features an exhibit space, connects people to the history of the building through the vibrant stories of immigrants who made the tenement home. German immigrant Lucas Glockner built 97 Orchard Street in 1863. At the time, this area of the Lower East Side was still known as Kleindeutschland, or Little Germany. Multi-story brick buildings – they became known as tenements – replaced small wooden structures that lined the neighbourhood’s narrow streets, and soon after, the area’s ethnic composition changed from a population of mostly German and Irish inhabitants to include newcomers of Italian and East-European Jewish heritage. 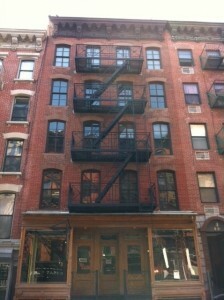 Unlike most tenement owners, Glockner lived with his family in the building during its early years. Over the next seven decades, almost 7,000 people resided in the five-storey building until its owners evicted its last tenants in 1935. During the 1950s, the city condemned the building because it failed to conform to new regulations requiring metal staircases. Then, historian and social activist Ruth Abram discovered 97 Orchard. Abram and her co-founder Anita Jacobsen aspired to use an old tenement as a venue to understand the immigrant experience in the United States. In 1988, they found 97 Orchard, a “time capsule” that had remained (officially) unused for decades. Researchers uncovered the history of the building and the lives of those who resided there, while preservation experts restored the rooms inside. Four years later, the first restored apartment was complete, a number that now stands at six apartments. According to its mission statement, the museum “forges emotional connections between visitors and immigrants past and present; and enhances appreciation for the profound role immigration has played and continues to play in shaping America’s evolving national identity.” To fulfill these aims, a number of activities take place. Over 40,000 students have come to the museum to experience the history of immigration and city life. ESOL (English for Speakers of Other Languages) students also arrive at the museum to learn English through a program that maintains a connection between lives of past immigrants and those of today. The museum features a stimulating website, where educators can download lesson plans to teach their students (elementary to high school level) about material history, archival documents, and oral history. Lectures, discussions, and other community events that explore the history of New York also take place at the museum. The best way for the first-time visitor to get to know the museum is to participate in one of the guide-led tours. These tours explore the restored apartments through the lives of the building’s families. Each tour focuses on a small number of real families of various ethnic backgrounds who lived at 97 Orchard in order to learn about wider historical themes of specific decades. If you can’t make it to Manhattan any time soon – you can get a sense via online tours found on the website. I opted for the “Hard Times” tour, which looked at two families struggling to get by during the economic depressions of 1870s and 1930s. Participation and conversation are key parts of the tours. At the outset, as we stood outside the stoop at 97 Orchard, our informative and energetic tour guide explained to us that she was going to ask us questions throughout the tour. This interactive dimension created a lively atmosphere between tour participants. She also asked us to turn off our cell phones – for the sake of historical accuracy, of course! The first apartment we visited was the home of the Gumpertzs, a German-Jewish family that migrated from Prussia in 1858. We were all immediately struck by the size of the apartment, which consisted of a small bedroom, an even smaller kitchen (featuring a coal stove), and a larger living room – the only room to feature natural light. Our tour guide revealed the most dramatic part of the Gumpertz story: Julius, husband to Natalie and father to four children, abandoned his family a year after the Panic of 1873. Natalie had to make ends meet by sewing. This led to a discussion about what strategies we might pursue if we needed help. Who would we turn to? With the state providing a minimal social safety net during the 1870s, people of the Lower East Side turned to family, friends, and local mutual aid societies for assistance. Next, we walked across the hall to our second apartment, inhabited by the Baldizzi family. The Baldizzis left Sicily in 1923. Greater restriction on immigration following passage of the Johnson-Reed Act a year later meant that the family probably arrived in the United States by “creative means,” as the tour guide put it. Entering the Baldizzi’s former home, our tour guide asked us to think about continuity and change. What was different about this apartment, restored to emulate the space during the 1930s, compared to the previous apartment? New technology stood out, as running water was installed in 1895, followed soon after by indoor plumbing. The building was wired for electricity in the early 1920s. An electric iron in the corner of the room signaled such change. Tour participants also noted more windows, as the building was retrofitted to increase air flow and natural light. After we heard about daily life for the Baldizzis and their struggles during the Great Depression, our tour guide asked us to share memories about how our own families had dealt with the economic trials of the 1930s. The tour ended with a discussion of life in the neighbourhood since the 1950s. The Lower East Side has seen an influx of immigrants from other areas of the world, especially Latin America and Asia. Our tour guide also mentioned the ways in which gentrification is having an impact on the area. Middle-class New Yorkers with disposable income are moving in. Old tenement apartments sell for astronomical prices and new luxury condominiums pop up. I suspect the museum is at the crossroads of this process. On the one hand, it seeks to preserve the legacy of past immigrants who struggled to make it in New York. It also provides useful services to more recent newcomers. On the other hand, the museum is a sign of the changing local economy. 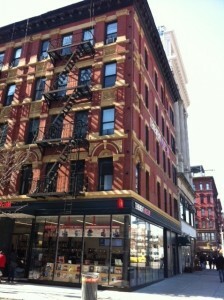 Orchard Street is now lined with chic clothing stores and hip restaurants. By attracting tourists and other visitors willing pay $22 (adult price) to see the tenements, the museum serves as a significant economic motor for the area. 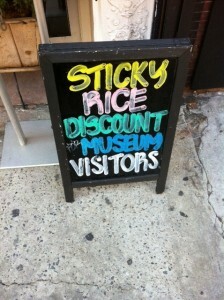 A nearby restaurant, for example, advertises a ten percent discount with purchase of a museum ticket. Local shop owners seem to realize that heritage can be good business. love this museum! and the chinese dumplings around the corner are fantastic, too. the museum also plays an active role in the international coalition of sites of conscience http://www.sitesofconscience.org/ which is worth checking out. Visiting this kind of museum would help make countless people wonder about their own heritage. How many immigrants lived in similar buildings as they scrathced out a living in a new country? It would be interesting to discover the careers of former renters and to discover the careers of their next generation. Always nice to know some people shop for knowledge in the “Big Apple”.